To view a list of the Northern California Beaches, click on these links to "Jump-To" or just scroll down. 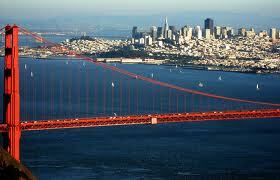 Northern beach counties include: San Francisco, Marin, Sonoma, Mendocino, Humboldt and Del Norte. Fog is common in these areas but brings a welcome respite from the hot summer days. Northern California Beaches offer rolling slopes and stretches of steep, rocky cliffs, so rocky that it can be difficult to access some beaches (with the exception of Gold Bluffs Beach, a 7 mile stretch of dunes and sandy beach.) It is a very rugged coast - largely untouched by humans and is the home of some of the world’s tallest trees. It’s truly a scenic wonderland with old growth coast California Redwoods. Aww, the sea life is abundant here. Dolphins, California gray whales in migration, sea lions, seals, porpoises and orca (killer whales) are often seen throughout the Northern California beaches. It is home to a rich variety of life, brown pelicans, gulls, puffins, cormorants, auklets, and pigeons flock throughout the area. The broken coasts tide pools are home to a diverse mix of seaweed, limpets, star fish, sea snails, kelp, urchins, barnacles, mussels, anemones, crabs, tiny fish and a myriad of other life forms. Freshwater and saltwater mix in several lagoons in the area where an abundant of other animal and plant life forms. Exploring Northern California beaches is FUN! Northern California Beaches are so much fun to explore! So what’s my favorite out of all the Northern California beaches? 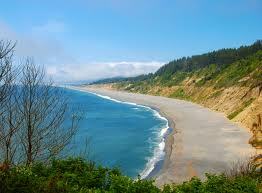 I’d have to say Agate Beach at Patrick’s Point. I think I love it so much because it’s usually a lot cooler up in the North Cal Beaches and this particular beach is covered with agates and small pebbles that soak up the sun. You can lay on them and feel the warmth, it’s amazing!